Ballet is the foundation for all dance styles. These ongoing, age appropriate classes teach correct form, placement, classical technique and French terminology. Pointe class is offered to the serious ballet student who demonstrates the prerequisite strength and proper training. Pre Ballet - These classes are a wonderful introduction to the world of dance! We use imaginative games and mime to provide a sound foundation for future dance education. Pre Ballet is recommended for ages 3-5. 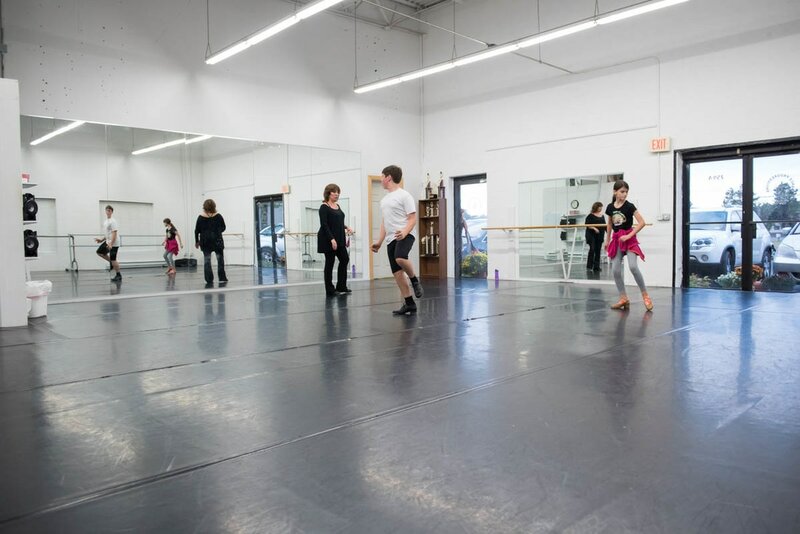 Ballet A - This class is the next step in the introduction to the world of classical ballet. The French terminology of classical ballet is introduced for the first time. Through class preparation, students learn the basics of classroom etiquette. Students learn how to wait for their turn, how to follow and how to lead, how to work in groups and work independently. Recommended for those who are ready to enter kindergarten. Ballet B - In this class, more complex steps are taught to develop the strength, flexibility and speed needed for classical ballet. Turnout is stressed for the first time. We also introduce the barre at this level. Recommended for those entering first and second grade. Ballet C - At this level, we are working toward the strength and flexibility needed for the study of dancing "en Pointe". French ballet terminology is repeatedly drilled. The exercises become more complex and difficult. Turnout is stressed even more at this level because the dancers bones are starting to harden. Stressing turnout before this level can have DISASTROUS and long lasting effects on the body. At the A and B levels, new steps are mastered within that class. At this level, new steps can take years to master. Recommended for 3rd grade and up. Ballet C (teen) - This class is designed for teenage students with little or no ballet experience. Students may not approach pointe work without mastering the skills taught in level C. Students may spend several seasons at this level. *** A note about Pointe work - Pointe work is not for everyone. Pointe class does not replace regular soft slipper technique classes. Pointe is an ADDITIONAL commitment. Hard work, dedication and natural ability are required. Students must be 12 years old and fully grown to study Pointe. Permanent negative effects to feet and joints will take place if the student has not developed the appropriate skills and strength needed. For these reasons, Pointe work is allowed by invitation only. Ballet D1/D2 - For the advanced dancer. Complete technical mastery of classical ballet is our goal for this level. A good command of French ballet terminology is needed. Pointe work is included if the student is ready. At this level, regular attendance is crucial in order to develop and maintain the required strength and skills to safeguard against injury as the technique becomes increasingly more difficult. Two levels of Ballet D are offered due to the amount of material covered in this course. Ballet E - For the advanced dancer. Class is by invitation only. Pre Ballet is for ages 3-5. All students start with this wonderful introduction to dance. We use imaginative games and mime to provide a sound foundation for future dance education. Kinder Tap is for ages 5-7. We prefer the student to be entering or attending kindergarten or first grade. This class is an introduction to basic tap and jazz techniques. Rhythmic exercise enhances children's memory, musical awareness, and coordination. Classic Jazz is one of many jazz dance styles. It evolved from the musical theater and is applied to Broadway, Jazz, Pop and Rock music. This class focuses on developing body strength and flexibility and mastering a variety of turns, leaps and jumps. We offer 3 levels of Classic Jazz. Jazz I is for students ages 7-9. Jazz II is for students 10-12. Jazz III is for the ADVANCED dancer with a good command of ballet techniques and terminology. Lyrical Jazz combines the techniques of ballet and jazz. Lyrical Dance is usually used to tell a story. A variety of pop/rock music is used. This class is not for students under 7 years old. Previous ballet and jazz training is recommended. We offer 3 levels of Lyrical classes. ​Lyrical I is for ages 7-9. Lyrical II is for ages 10-12 and this level caters to students with limited ballet background. Lyrical III is an ADVANCED class for students that have a good command of ballet and jazz techniques and terminology. Contemporary is a mixture of modern, ballet, and jazz techniques. It is an athletic class utilizing a variety of turns, leaps, jumps, and acrobatic skills. We offer 3 levels of Contemporary training. Contemporary basics, Level II and Level III. Hip Hop follows the latest dance trends. Sometimes known as Street-Jazz, this class introduces basic break-dancing and pop/lock styles and uses the newest R&B/pop music. We offer 3 levels of Hip Hop as well as a BOYS ONLY class. Hip Hop I is for students 7-9. Hip Hop II is 10-12. Hip Hop III is a more advanced class for ages 13 and up. We also offer a Boyz Hip Hop Dance Crew. This is a level II competitive group and is offered by audition only. Hip Hop Fusion is a combines a variety of Hip Hop styles with Contemporary dance techniques. This is an open level class for middle school and high school students. Breakdance combines body conditioning and strength-building excercises with coordination drills and dance elements. We offer 3 levels of Breakdance. 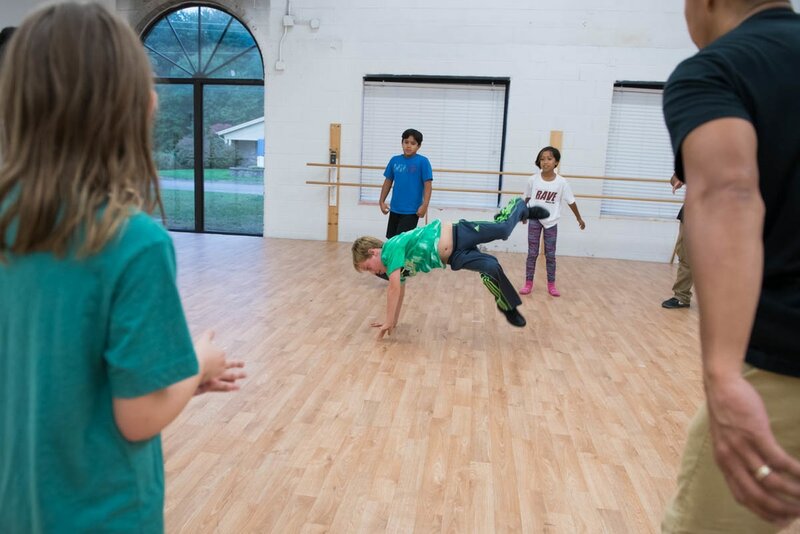 Breakdance basics for ages 5-9. Breakdance II for ages 10 and up. Breakdance III is an advanced class by invitation only. Acrobatics is a combination of dance techniques and gymnastic tumbling skills. We offer three levels and a boys class. Level placement is based on experience.